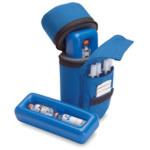 This is a handy diabetes carrying case for insulin and related diabetic supplies. 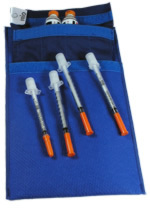 Made of durable, water resistant nylon, this cool insulin pack neatly organizes up to a one weeks supply of diabetic supplies in several pockets and storage compartments. 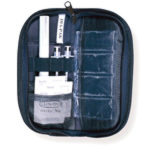 Cool gel pack not included. Measures 5 in x 6 1/2 in x 2 1/2 in and comes in Blue or Black.